Cambridge's iconic riverside pub on the Cam, famous for our stunning views across the water, our awesome ever changing ales, home cooked food & Pink Floyd! Whether it's drinks, lunch, dinner or sundowners on our deck watching the punts go by, no visit to Cambridge is complete without a visit to The Anchor. Our riverside terrace is perfect for those sunny days with a brilliant view of tourists, students and locals crossing the river on the punts. A fantastic people watching spot! We serve fresh seasonal food using locally sourced ingredients, almost everything we make is in-house. The best of local brewers fill our ale racks so trying a new pour is a must do. From our guaranteed IPA and Steadfast to our ever changing selection from Bishop Nick, Nene Valley & Milton often not seen elsewhere in Cambridge. With the ever changing seasons sometimes all four in one day we have it covered but that’s not to say that we don’t throw in the odd curve ball. 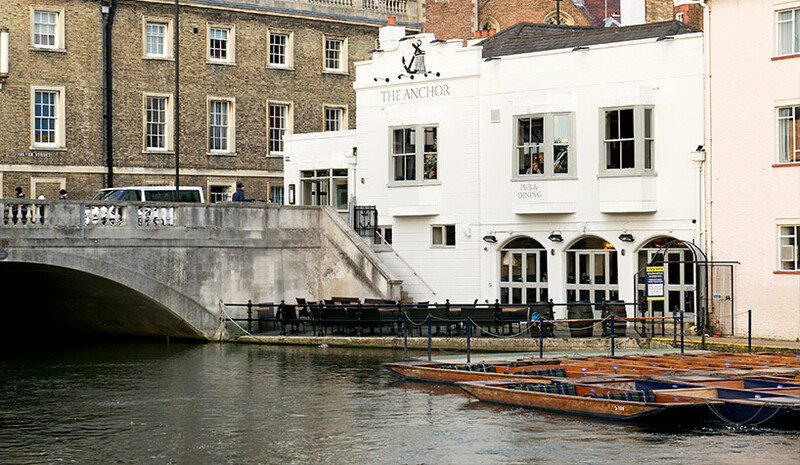 Set on the banks of the beautiful river Cam in the historic city of Cambridge, The Anchor pub, dining room and river terrace is a stone’s throw away from the world famous Queens’ College & its stunning Mathematical Bridge. With a fantastic dining room overlooking the river and probably one of the best dining views ever we serve a fresh seasonal menu. In our Upper & Lower decks we have several snug areas and a stunning riverside terrace watching over the punting and shenanigans on the river, there truly is something for everyone! We are also very well known for Pink Floyd but just look at our walls to find out! We are very proud of our heritage and everything to do with The Anchor so drop in and see us.